The return of a firm favourite at Dreadnoughtrock playing a wide selection of covers and their own material. Just 3 quid at the door. 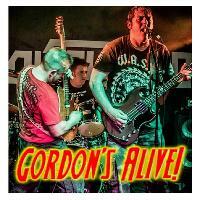 Great to see Gordon's Alive back at their home from home for a FULL NIGHT of Rock Originals and some full on Rock cover action from a superb power trio. A firm favourite at Dreadnoughtrock it's always a pleasure to see these guys perform. Rock Club action straight after the live session but if you are in for the gig you are welcome to stay on and Rock thro till 3am with us as well. GENERAL ENTRY is £3.00 - PAY AT THE DOOR - No Tickets on sale in advance. Free entry to ALL VIP CARD HOLDERS.